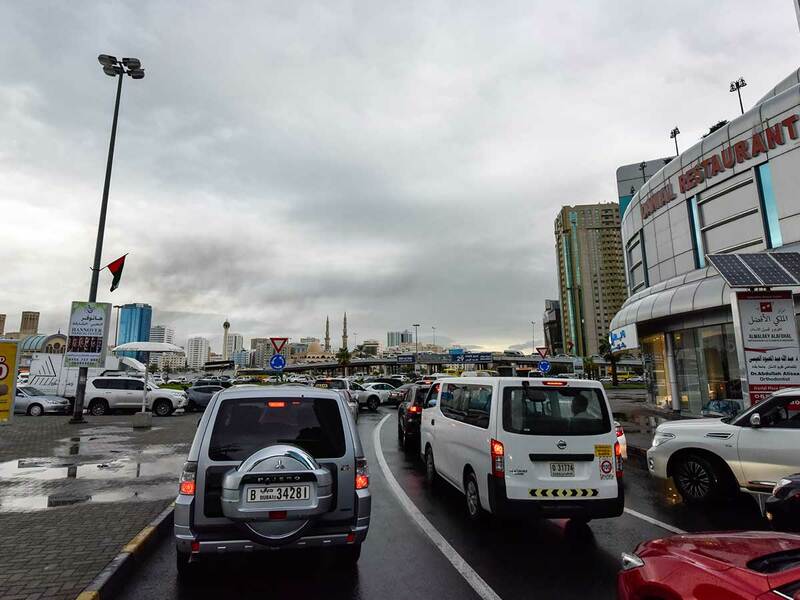 Dubai: Rains and traffic accidents caused traffic to crawl to a standstill in many parts of the UAE on Monday morning, while some flights experienced delays. Authorities urged motorists to take extra caution and reduce speeds when navigating wet passageways and highways, to avoid more accidents. “We request the motorist to drive carefully and safely due to rain on some internal and external parts of Dubai,” the Dubai Police said on Twitter. Traffic tends to slow down during rainy weather, as drivers reduce speed in slippery conditions and poor visibility. Driving at high speeds can cause motorists to lose control of the vehicle. During the early morning rush hours, between 7am and past 9am, a couple of accidents occurred in some areas in Dubai, while motorists in many parts, including Sharjah, were caught in very long tailbacks. Emirates Airline confirmed that some flights into and out of Dubai International Airport have also been delayed due to bad weather conditions, and flyers were advised to check with their carrier for the latest updates. “Due to adverse weather conditions in the UAE, a number of Emirates flights into and out of Dubai have been delayed. Customers are requested to check the status of their flights on emirates.com for latest updates on departure and arrival times of their flights,” the airline said in a statement. 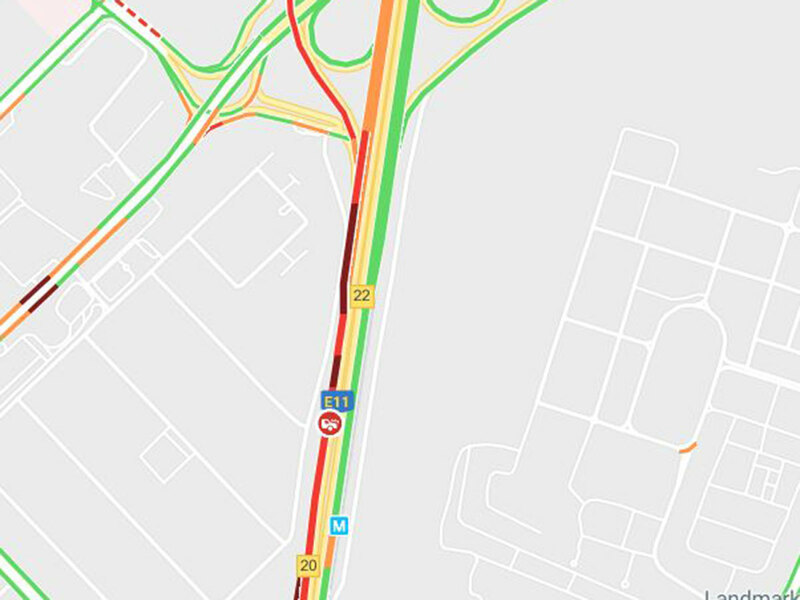 As of 7:11am, at least one accident occurred on Shaikh Mohammad Bin Zayed Road, just before the City Centre Mirdif bridge, causing delays to Sharjah-bound vehicles, according to Dubai Police. 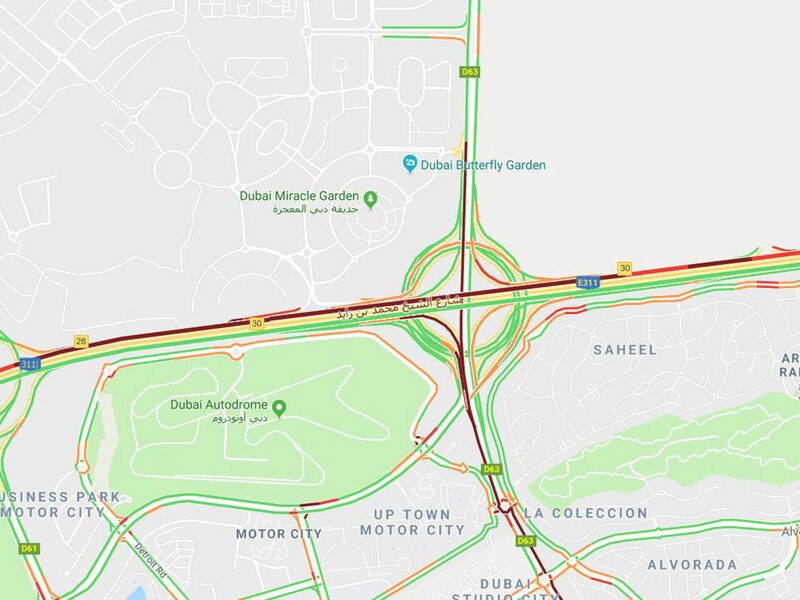 Motorists driving towards Abu Dhabi were stuck in heavy traffic on Shaikh Zayed Road as of 9:23am, with tailbacks stretching more than 7.26 kilometres, from the interchange near the Jebel Ali Industrial Area all the way to Jumeirah Lakes Towers. A road crash was also reported in the area near the Danube Metro Station, according to Google Map. Heavy traffic was likewise causing delays on Shaikh Zayed Road, from Mall of the Emirates to the area near Noor Bank Metro Station, as well as in other locations, including the Dubai-Sharjah Road, Ras Al Khor Road and sections near Dubai Mall, Zabeel Park, Dubai Garden Glow, Al Jaffliya Metro Station and Dubai World Trade Centre, among many others. 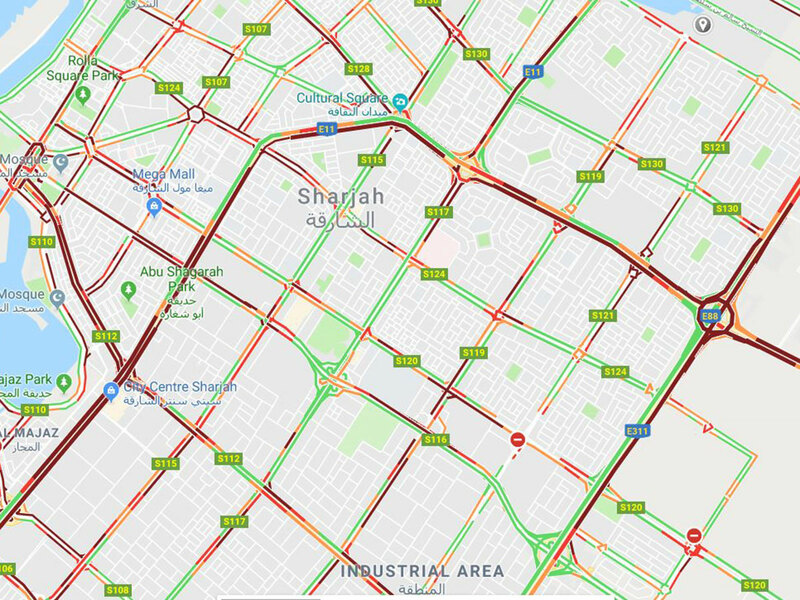 Several locations in Sharjah were also experiencing very serious traffic jams, including those in the vicinity of Abu Shagarah Park, Cultural Square, City Centre Sharjah, Mega Mall, King Faisal Mosque, Al Majaz and Saif Zone.